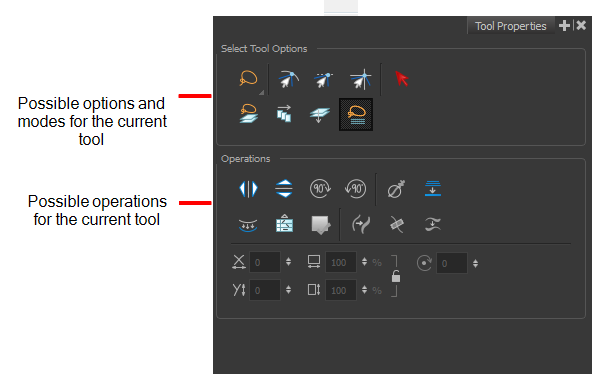 The contextual Tool Properties view contains the most common options and operations related to the currently selected tool. As soon as you select a tool from the Tools toolbar, the Tool Properties view updates. For example, if you choose the Select tool in the Tools toolbar, the Tool Properties view will display the options and operations related to the Select tool, such as Snap to Contour, Apply to All Drawings, Flip Horizontal, and Flatten. Operations are actions you can perform while using the selected tool.